The Saucy Rig has been update to version 1.5 here. If you think that you would like to install and use the Saucy Rig in your own model(s) then you are welcome to download it from the main Saucy Rig page. This rig is inspired greatly by the rigs of David Simmons (Squetch Rig), Mark Skodacek (A:M 2008 Rig), and Steven Cleary (Steve’s Hand Gizmo). The layout and functionality of the rig’s control bones are almost identical to the A:M 2008 Rig. The underlying Soft IK system in the rig that prevents the IK limbs from “popping” when fully extended comes directly from the Squetch Rig. The foot controls are also derived from the Squetch Rig. 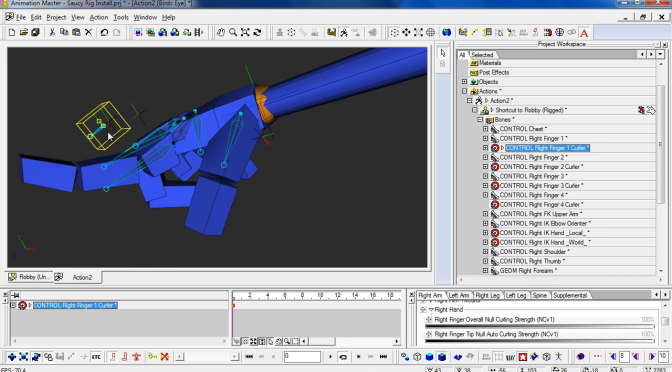 Finally, the underlying framework that I used from the hand portion of the rig was based heavily on Steve’s Hand Gizmo. This rig was originally designed as a working relief for me and, therefore, raises no claim or guarantee that it will work well for you (or even work at all). I will not offer any support for this work beyond what I have already posted or may post in the future by my own volition. You should use this rig at your own risk. Make sure you always have backups of your important work. The Saucy Rig was designed for ease of installation and ease of use while animating. You only need to see and position these bones to install the rig into your character model. 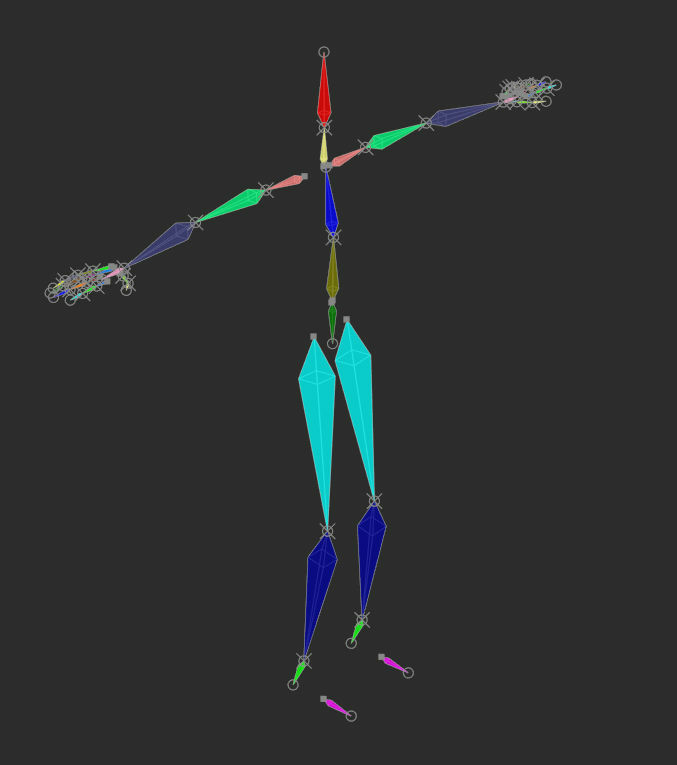 Installing the rig into a character model only requires the manipulation of the rig’s geometry/ deformation bones. These are the bones that the control points of the model get assigned to directly. There is no need to manipulate or even see any of the rig’s other bones or substructures during the install process. Veteran A:M artists may find that approach similar to a plug-in that used to be produced for A:M called the Setup Machine by Anzovin Studios (which is no longer developed for A:M but still is for Maya). The Saucy Rig is not a plug-in though. It is an ordinary A:M format model file that contains the bones and the relationship data for the bones that make up the complete rig itself. In addition to ease of installation, layout out of the rig is designed for ease of editing and ease of upgrading. If I were to update this rig, the rig is setup to allow the user to update the rig by dragging the contents of the update into the rigged model and then activating a designated “on” switch to set everything into place. There would be no tedious re-rigging necessary by the user. This is made easy for the artist because the way the rig is laid out “behind the scenes”. 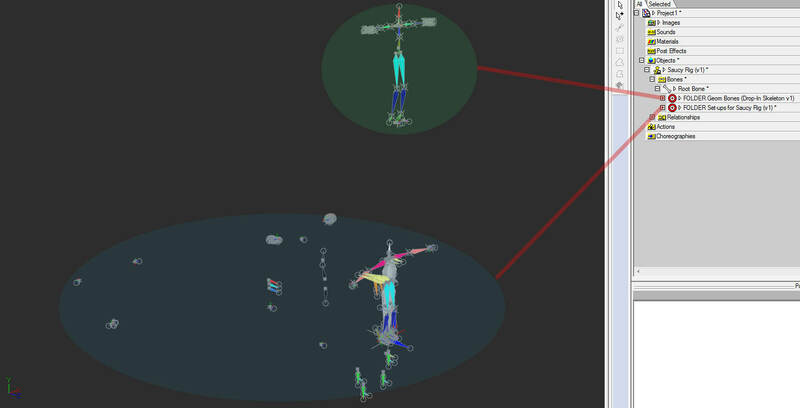 Separate hierarchies in the rig for geometry bones and control bones make installation, editing, and even upgrading rigs much easier. The Saucy Rig is setup with two completely separate primary structures. The first structure is the geometry bone hierarchy. That structure contains the bones that the model gets attached to. Without the second structure though, these bones would not offer good control to an animator. Here the second hierarchy is also shown so that you can see all of the setups that are usually hidden. The second structure is all of the other bones and setups that the model is not directly attached to but is eventually controlled by once the model is completely rigged. Neither of the hierarchies are embedded in one another. The relationships included with the setup bring all of the components of the rig together. This makes editing or updating the rig very easy for the user since all that the user needs to do to edit the model is to interact with the geometry bones. Upgrading would only involve dragging and dropping items in A:M’s project workspace. Adding new relationships to the model and/ or adding new setups to the “FOLDER Set-ups for Saucy Rig (v1)” null is all that would be necessary. With this setup in mind, the Saucy Rig could even be swapped out altogether and replaced with an entirely different rig that is designed to follow suit with this type of modular setup. 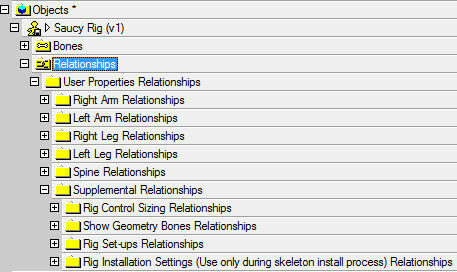 The geometry bones hierarchy would be left untouched while the Saucy Rig hierarchy and its relationships would be deleted from a designated copy of the model. The new rig’s setups would be dragged into place and bound to the model in an Action window and then exported as a newly rigged file. The user would not need to re-rig since they had already assigned the model’s control points to the geometry bones previously. There are a lot of possibilities that this rigging approach offers. In the future, I may post more of my thoughts on this. For now though, I’ll be taking a long vacation from rigging. Hi, this is really amazing and nicely done. thank you very much for all the work u put into this and especially for the very good documentation (which is often very annoying to do). The foot/heel roller and the finger null controls are a highlight for me.